Aviva is an antibody production company with offices in the Sorrento Valley, San Diego biotech community. We have manufactured over 30,000 antibodies to date. Many are currently on the website at www.avivasysbio.com, but we have others available which we may consider for future testing. Please note that 100% of our antibodies on www.avivasysbio.com are manufactured and quality control tested by us and are in inventory in our San Diego facility. Aviva’s extensive catalog of high-quality antibodies positions the company well to fuel antibody array development. ● >15,000 antibodies in inventory at our San Diego facility. We believe this makes us one of the largest polyclonal antibody producers in the market. An antibody array allows for the screening/profiling of multiple proteins within a samples entireproteome. 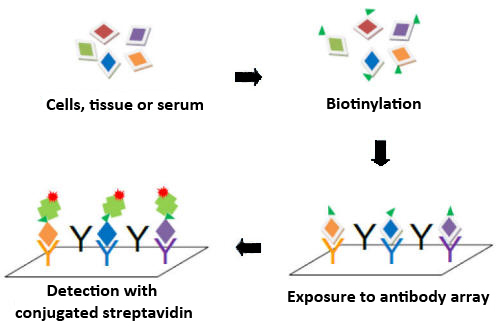 The methodology behind antibody arrays is much like that of an ELISA.Antibodiesare immobilized and bound to the slide support through covalent interactions.Proteinsare extracted from control and experimental samples and labeled with appropriate conjugate (biotin or biotin-fluorophore). After cleanup to remove any unbound, free label, the proteins are allowed to bind to antibodies on the array (membrane or glass). Once bound, the array can be visualized for those proteins labeled with a biotin-fluorophore. If proteins were labeled with biotin alone, visualization is done through fluorescence or chemiluminescence, usually involving a streptavidin conjugate. Depending on whether a membrane or glass slide array is used, visualization can be done using a microarray scanner or by exposure to X-ray film. Each array includes positive, negative and internal controls. Redundancy in the number of antibodies spotted onto the array ensures effective and accurate results. Sample Preparation: Proteins from a variety of sources can be used in antibody arrays. What researcher needs are addressed by antibody arrays? What kind of samples can I test on arrays? Are array results quantitative or qualitative? How is background dealt with? What is the range of the # of antibodies/array? What data is generated and how is it analyzed? ● Disease detection- Disease/condition-specific antibody arrays exist for kidney injury, fertility hormones array, cardiac arrays, drugs of abuse arrays, growth promoter arrays, synthetic steroid arrays, etc. This effort attempts to identify biochemical markers for screening and early intervention in women for psychosocial stress using biochip arrays. Plasma concentrations of 17 different cell signaling proteins were measured in 195 women on long-term sick-leave for a stress-related affective disorder, 45 women at risk for professional burnout and 84 healthy women. Significant increases in the levels of MCP-1, VEGF and EGF were found to be potential markers for screening and early intervention of women for prolonged psychosocial stress. Metastasis is a biological cascade of multiple steps: loss of cellular adhesion, increased motility and invasiveness, entry and survival in the circulation, exit into new tissue, and eventual colonization at a distant site. This suggests that cells containing metastatic lesions would have to accumulate expression of multiple, if not all, genes necessary for successful execution of the metastatic cascade from the primary tumor. Therefore, important and long-standing questions that remain concern the identity of genes that mediate these metastasis-promoting processes. Identification and characterization of these genes will not only shed new insight into the molecular basis of cancer metastasis but also inform therapeutic strategies to improve the outcome of treatment of human cancers. Arrays were used in this paper to give insight into factors that promote metastasis of human cancer cells. The development of insulin resistance and type 2 diabetes is determined by various factors, including defects within the insulin signaling pathway. These mechanisms are still largely unresolved because of the complexity of the molecular events. In this study, an expression and activation state profiling of multiple known key signaling biomolecules involved in insulin metabolic and mitogenic signaling pathways was evaluated using a phosphospecific antibody array platform. This insulin signaling antibody array provides a powerful and effective way to investigate the mechanism of insulin resistance and likely assist the development of innovative therapeutic drugs for type 2 diabetes. ● Experimental– Choose species specific array available from array suppliers, discover interaction partners, etc. Ginseng has been shown to inhibit cancer cell proliferation and tumor growth, however the mechanisms underlying this inhibition have yet to be elucidated. Using antibodymicroarrays, it was determined that several key cell survival proteins were altered in Ginseng-treated cells, including several members of the mitogen-activated protein kinase (MAPK) family. These results suggest that American ginseng may act to inhibit breast cancer cell proliferation by increasing the expression of RKIP, resulting in inhibition of the MAPK pathway. This novel mechanism has implications in the potential prevention and treatment of breast cancer.